Tag line: "The Voice of the Tempter"
Four years after directing the horror classic Nosferatu, director F.W. Murnau returned to the genre once again with Faust, and in so doing delivered yet another gothic masterpiece. Vying for control of the entire world, the demon Mephisto (Emil Jannings) makes a wager with one of God’s Archangels (Werner Fuetterer) that he can corrupt the soul of a good and honest man. To this end, Mephisto turns his attention towards Faust (Gösta Ekman), an elder scientist who has devoted his life to helping his fellow man. Setting his plan in motion, the demonic Mephisto unleashes a plague on the city, one that leaves hundreds dead in its wake. Try as he might, Faust is unable to cure this fatal illness, and in his anger turns against science and God and summons the devil, in the hopes the Dark Prince will stop the spread of the disease. Shortly after Mephisto appears to Faust, the plague ends, but the townsfolk, realizing who actually helped them, try to execute Faust by stoning him, forcing the scientist to retreat into his house. It’s at this point that Mephisto launches the second portion of his scheme and changes Faust from an old man into a young one. Once this is complete, he shows Faust images of a beautiful Italian Duchess (Hanna Ralph), then promises to deliver her if he'll agree to surrender his soul. When Faust hesitates, Mephisto sweetens the deal by offering the former scientist a 24-hour “trial” period, promising to return him to normal in a days’ time if that’s what he desires. Sure enough, after stealing the Duchess from her new husband the Duke (Eric Barclay), Faust finds that he’s quite happy in his new way of life, and, with Mephisto as his servant, he revels in his debauchery. During his travels, Faust meets a young, innocent girl named Gretchen (Camilla Horn) and falls deeply in love with her. With Mephisto’s help, Faust sets out to entice this fair maiden, yet when a run-in with her brother (William Dieterle) turns violent, it leads to a scandal that could ultimately cost Gretchen her life. Will Faust do right by Gretchen, or will she be left to suffer on her own? 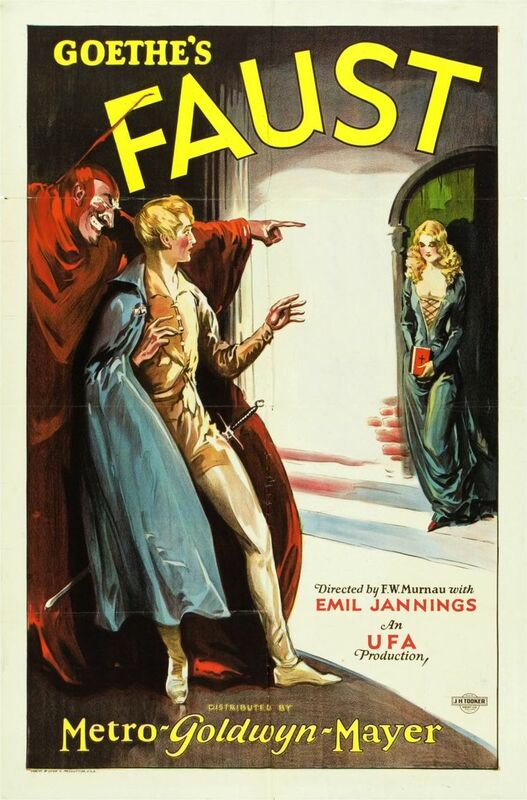 Based on the famous play by Johann Wolfgang von Goethe, Faust is an extraordinary motion picture, telling a tale of good vs. evil in a very stylish and engaging manner. Gösta Ekman does a fine job as the title character, and the make-up that transforms him into an elderly man is practically undetectable (at the outset, I had no idea Ekman was in his mid-30’s when the movie was made). Yet it’s Emil Jannings, delivering a tour-de-force performance as Mephisto, who steals the show. Whether smiling slyly in the background, knowing that he has Faust under his control, or getting directly involved in Faust’s affairs (in what proves to be a humorous scene, the demon pretends to seduce Gretchen’s Aunt Marthe, played by Yvette Guilbert), Mephisto is utterly fascinating from start to finish, and every bit as evil as you’d expect. More than anything, though, Faust is visually stunning, with Murnau using camera tricks and special effects to bring this macabre story to life. In what is the film’s most ominous scene, Mephisto, grown to an enormous size, towers over the town suffering from his plague, a smile curling his lips as he admires the chaos below (one poor soul sees Mephisto’s face emerging from the clouds and immediately drops dead). Murnau’s penchant for the spectacular is on display throughout Faust, and while I still consider his 1927 film Sunrise to be his most imaginative use of the medium, there’s no denying that Faust was the work of a master craftsman.